Saturday’s ad is for the Frank Fehr Brewing Co., from 1950. 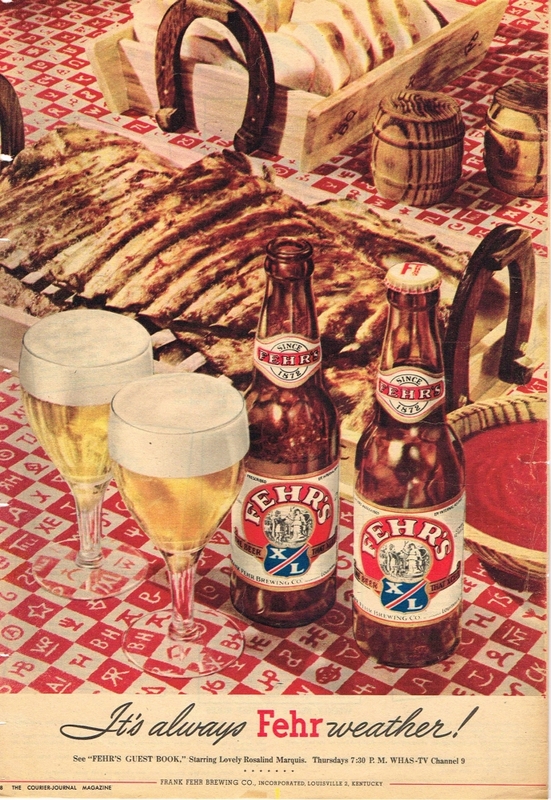 The Louisville, Kentucky brewery is advertising their Fehr’s XL Beer as a pairing with ribs. The ribs are laid out on a red and white checkerboard tablecloth with bread and a bowl of sauce. I’m not sure about the horseshoe handles on the baskets, which make it look like a yee-haw sort of restaurant, but if the food is tasty, then why not. 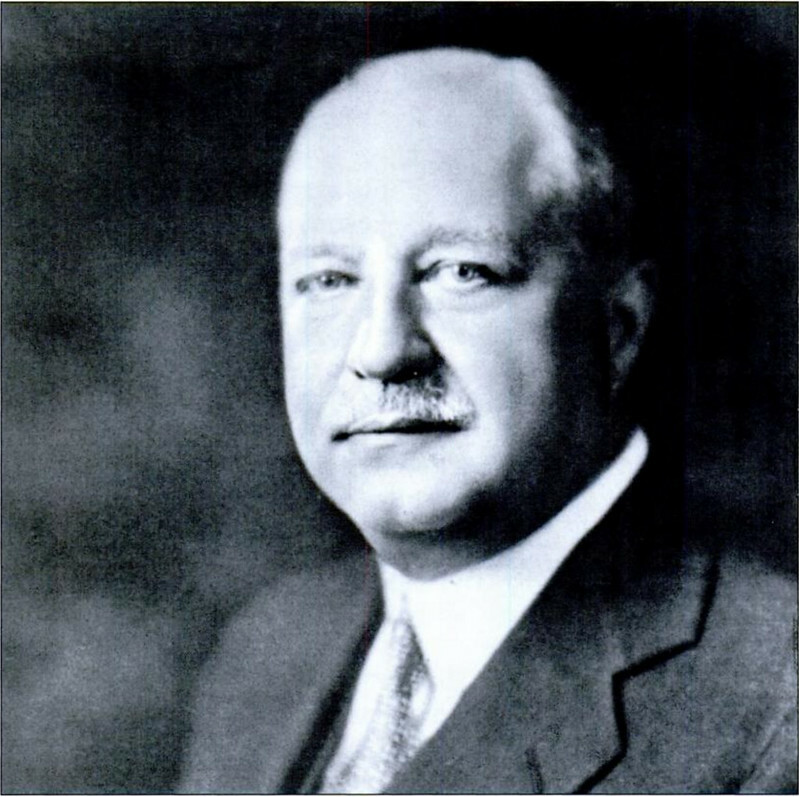 Today is the birthday of Louis J. Hauck (June 30, 1866-April 30, 1942). 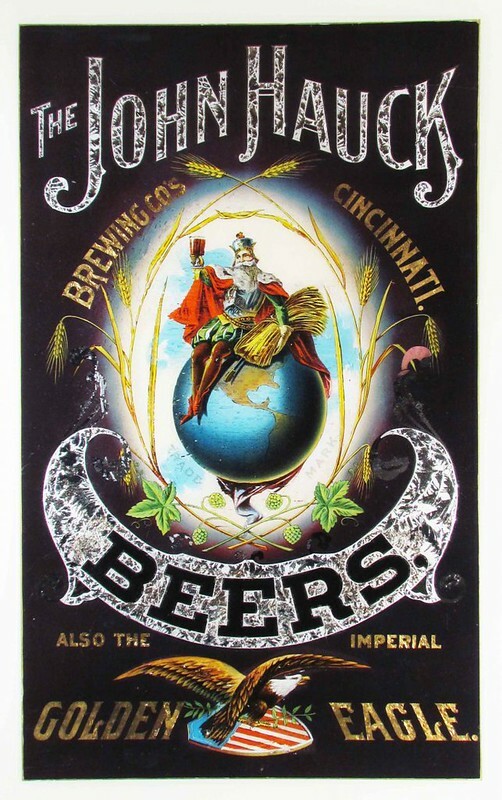 His father, John Hauck, founded the John Hauck Brewing Co. in Cincinnati, Ohio in 1863. 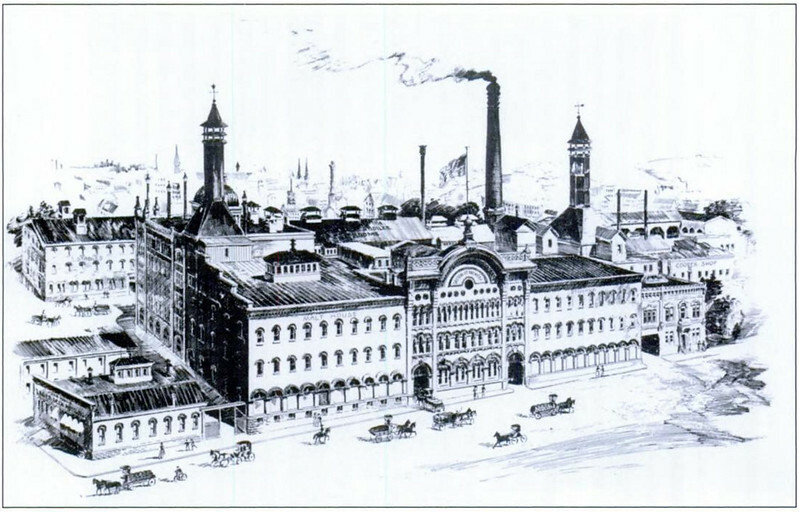 In 1879, Hauck bought out his partner and a few years later changed the name of the brewery. Louis became president in 1893, when his father retired. It continued as the John Hauck Brewery or the Dayton Street Brewery until prohibition. After it ended, it reopened as the Red Top Brewing Co. and continued until closing in 1956. John Hauck and John Ulrich Windisch teamed up to start their brewery back in 1863 located on Dayton Street near Central Avenue. They ended up purchasing five acres located close to the Miami-Erie Canal which the water was used to fill the steam boilers and provide the power for the machinery. Both guys at one point called their business the Dayton Street Brewery which was producing 10,000 barrels of beer in their first year. By 1877, they were producing 32,000 barrels and two years later he bought Windsch’s shares of the brewery. In 1881, the brewery was producing 160,000 barrels of beer. 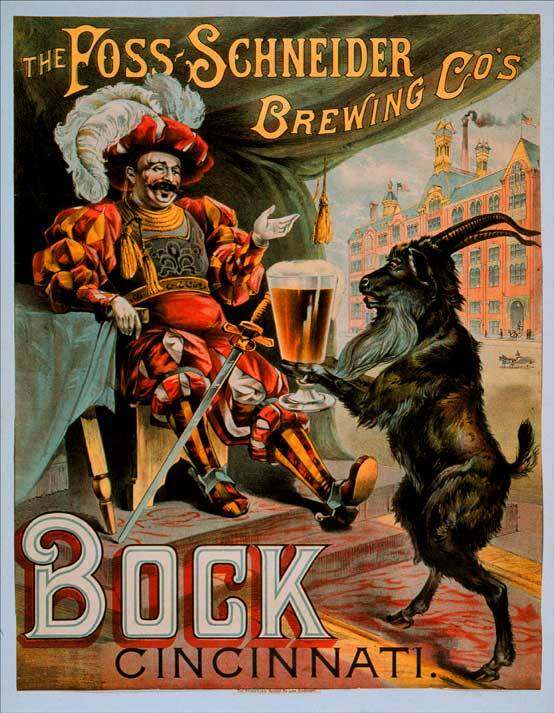 By 1882 the brewery was officially the John Hauck Brewing Company. There was also a John Hauck Beer Bottling Company that was established that same year. 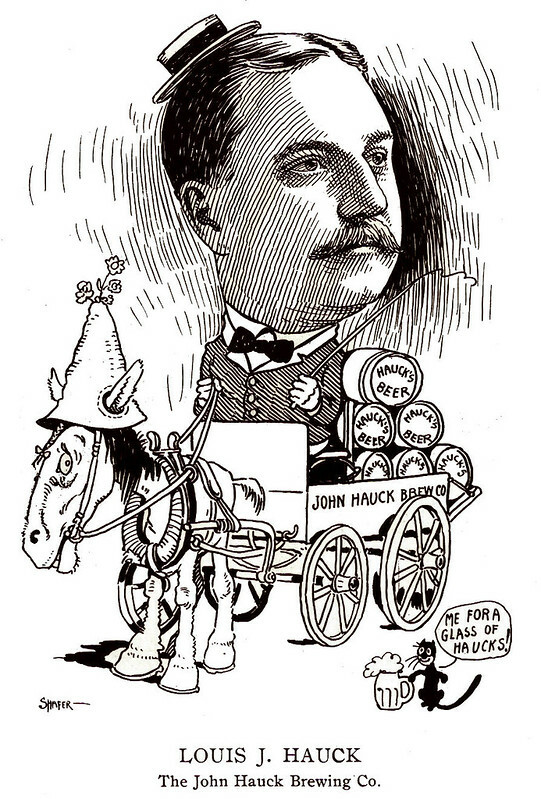 John Hauck was against bottling his beer though saying that it changed the flavor of the beer but in order for him to do business with more distant markets he had to agree with the bottling of his beer. By 1884 the brewery was covering the block which was bounded by Central, Dayton, York Streets and Kewitt Alley. The only remaining building from this brewery is the bottling works which stands on Central Avenue bear Dayton Street. The Hauck and Windisch farm actually still stands as well located near Crescentville Road. Louis Hauck then had the original Hauck farm house replaced in 1904 with a mansion located at 12171 Mosteller Road. The John Hauck Brewery, a.k.a. the Dayton Street Brewery. A caricature of Louis J. Hauck done around 1903. Today is the 43rd birthday of Hildegard Van Ostaden, brewmaster at Urthel, one of only a handful of female brewers working in Belgium. Inspired by a trip to Alaska’s barleywine festival, she also brewed the first American-style Imperial IPA in Belgium. 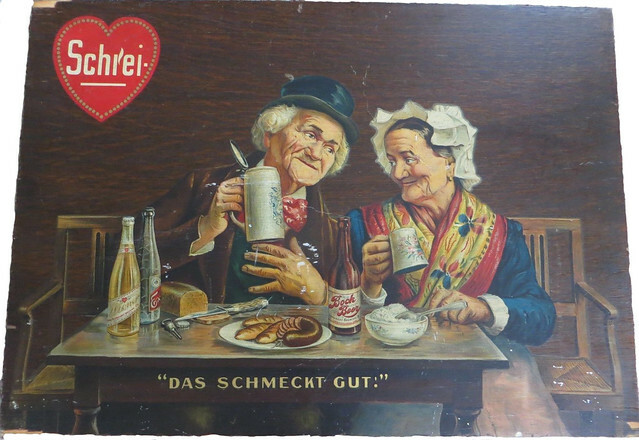 Her beers are all great, and I love the illustrations on the labels that her husband Bas does. Join me in wishing Hildegard a very happy birthday. 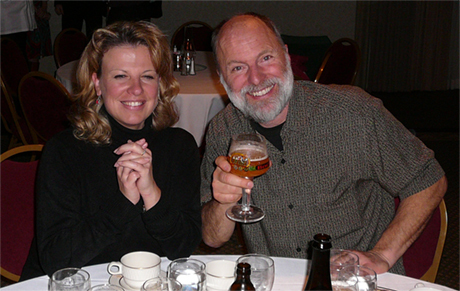 Hildegard with Brian Hunt of Moonlight Brewing at the Beer Chef’s Urthel dinner. 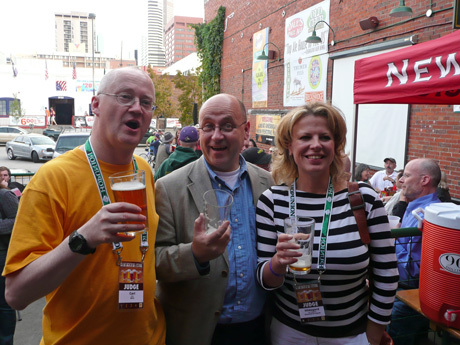 Outside the Falling Rock, fellow GABF judges Carl Kins, from the EBCU (on left), and Hildegard (on right) along with her husband Bas (in the middle) during GABF in 2007. 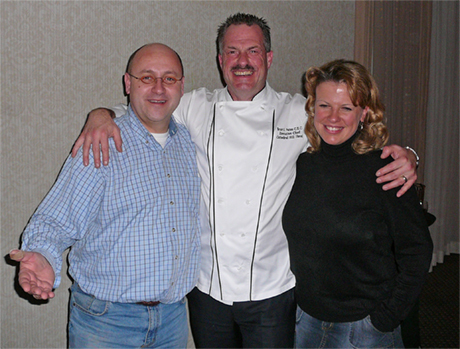 Bas van Ostaden, Bruce Paton and Hildegard after their dinner in 2007. 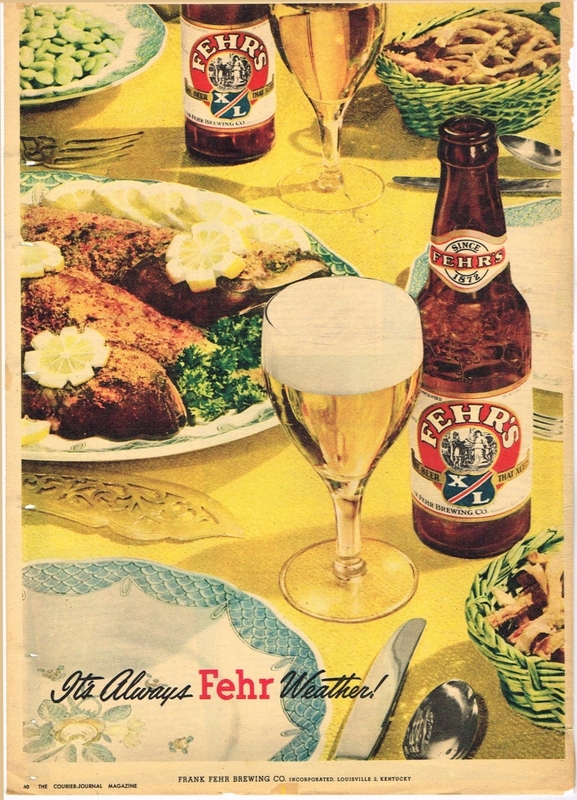 Friday’s ad is for the Frank Fehr Brewing Co., from 1950. 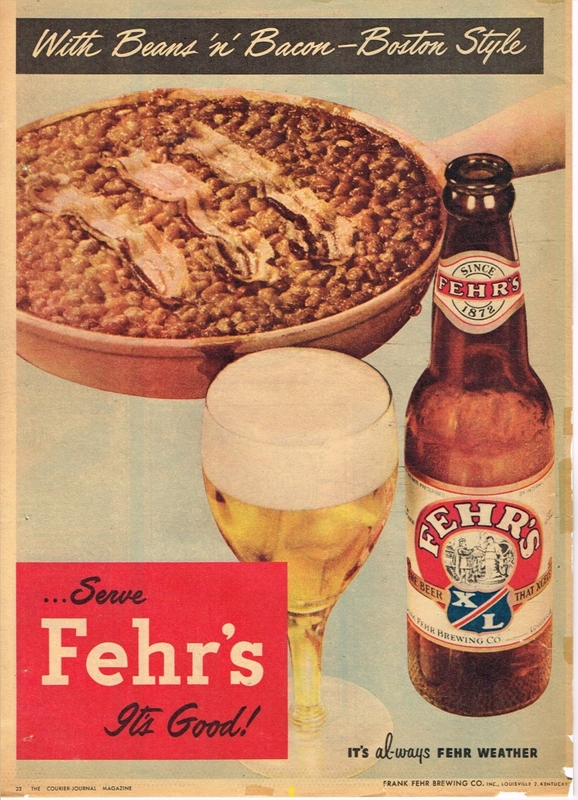 The Louisville, Kentucky brewery is advertising their Fehr’s XL Beer as a pairing with Boston baked beans and bacon. I think is well before the days when advertising agencies hired professional food stylists to make the food look perfect, and as appetizing as possible. And while they’re still using their tagline, “It’s Al-ways Fehr Weather,” I confess I don’t understand why there’s a hyphen in always. Today is the birthday of Pablo Díez Fernández (June 29, 1884-November 17, 1972). He was born in Vegaquemada, León, Spain. His mother died when he was three, and was raised by his grandparents. “He studied Classical Literature and Philosophy at the Instituto Municipal de Boñar, and when he turned 16 he joined the Dominican Monastery of Cangas de Narcea. Soon after his 20th birthday, when he was about to be ordained, Pablo Díez decided that the priesthood was not his true calling in life and moved to Madrid. In 1905, with the help he got from the Dominican Friars themselves, he sailed out to Mexico.” In Mexico, he became a successful businessman and in 19292 helped to start the brewery, Cervecería Modelo, which would later become Grupo Modelo. Pablo Díez Fernández was the son of Ceferino Díez and Gregoria Fernández, Pablo Diez was born in Vegaquemada, León, Spain, on June 29, 1884. After the death of his mother when he was only three years old, he was raised by his paternal grandparents in the town of Palazuelo de Boñar. He studied Classical Literature and Philosophy at the Instituto Municipal de Boñar, and when he turned 16 he joined the Dominican Monastery of Cangas de Narcea. Soon after his 20th birthday, when he was about to be ordained, Pablo Díez decided that the priesthood was not his true calling in life and moved to Madrid. In 1905, with the help he got from the Dominican Friars themselves, he sailed out to Mexico. Once in Mexico, he took on a job as book keeper at the Venegas bakery. In 1911 he became the manager of another bakery called La Primavera. As a result of his hard work, he was able to save enough money to first partner with and then, in 1912, buy that business from its previous owners. The following year, Diez Fernández became one of the founding shareholders of Leviatán y Flor, a company which has been recognized as the first compressed yeast factory in Mexico. In 1918, he married Rosario Guerrero Herrero, whom he had met during one of his many visits to Spain. Four years later he became part of the community of distinguished businessmen, industry experts, and bankers that would put up the capital to start the business which was later to become Grupo Modelo: Cervecería Modelo. A shareholder since the very beginning and member of its Board of Directors since 1926, the businessman from the region of León in Spain continued to care for his bread and yeast production businesses while also promoting other new adventures. One of them, Pan Ideal, is famous for having been the first mechanical bread producing plant in Mexico. 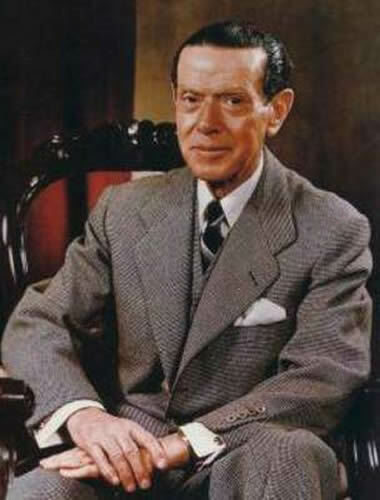 In 1928, Pablo Diez was appointed to the Board of Directors of El Crédito Español de México, SA and of other important businesses of the Spanish community in Mexico. That same year, Braulio Iriarte entrusted him with the responsibility of being the legal representative of Cervecería Modelo. He was 44 years old at the time. Diez Fernández founded seminars, sanctuaries, and hospitals in his country of origin, for which he was highly recognized. The latter is also true for Mexico, where his philanthropic work left a profound mark on the development of nursing homes and hospitals. Among them the most recognized are the Sanatorio Español, the Red Cross’s central hospital in Mexico City and the Instituto Nacional de Cancerología; he made important donations to help build all these institutions. In 1955, don Pablo Diez crowned the Virgin of Guadalupe as the Queen of Work, sharing in the devotion shown for the Virgin by the workers in the largest of his companies: Cervecería Modelo. In recognition of this philanthropic work and his entrepreneurial accomplishments, in 1969 Don Pablo Diez received the highest honor granted by the Mexican government: the Orden del Águila Azteca. He was also a relevant shareholder in other companies in Mexico including IEM, Condumex, Fundidora Monterrey, Celanese Mexicana and Banco Nacional de México, and he served as the first Vice-president for this bank. In Spain, Cervecería Cruz Campo and Banco Central Hispano held his most relevant investments. Just before he retired from public life, although he remained as Honorary Chairman of Grupo Modelo, Diez Fernández turned over the business to the people close to him who had managed it for several years. The main shareholders of the new company that controlled Cervecería Modelo, a company whose sales in 1970 were estimated somewhere between 850 and 900 million pesos, were Juan Sánchez Navarro, Manuel Álvarez Loyo, Nemesio Diez, Secundino García, Antonino Fernández, Pablo Aramburuzabala and other employees of the brewery which would later on become Grupo Modelo, the seventh largest beer group in the world, when it was headed first by Don Antonino Fernandez and, then, by Carlos Fernandez Gonzalez. Don Pablo Diez Fernández died on November 17, 1972 in Mexico City. Grupo Modelo, S.A. de C.V. is the largest beermaker in Mexico, holding 55 percent of the national market in 1998, when it was the 12th-largest beer producer in the world and the most profitable brewer in Latin America. Its best known brand is Corona Extra, a light brew that ranked first in sales among beers imported to the United States in 1997 and fifth in the world in total production. The company also produces nine other brands of beer. A holding company, it is vertically integrated, beginning with its overseeing of the selection of seeds and germination of hops, and including brewing and bottling plants and distribution by trucks and ships. Grupo Modelo was, in the late 1990s, 50.2 percent owned by Anheuser-Busch Cos., the world’s largest beer-producing company, and it was the exclusive importer of Anheuser-Busch’s products in Mexico, including Budweiser and Bud Light. Anheuser-Busch did not, however, hold a majority of Grupo Modelo’s voting shares. Beer was the basis for the holdings of the Sada and Garza extended families, whose Monterrey Group became the most powerful business combine in Mexico. Cervecería Cuauhtemoc was founded in Monterrey in 1890. Its chief rival was Cervecería Moctezuma, founded in 1894. 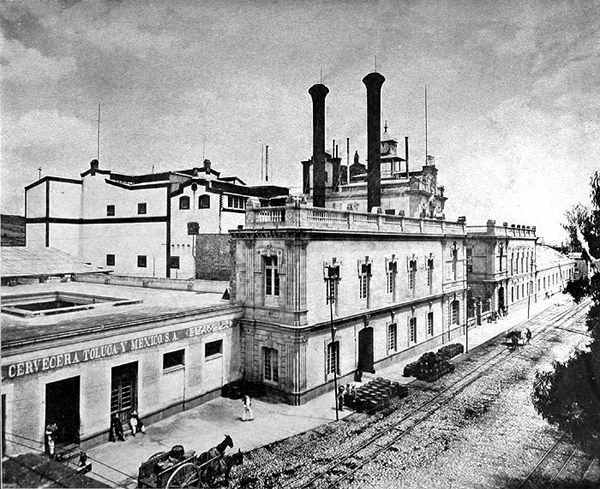 Cervecería Modelo, which eventually outstripped the other two in production and sales, was founded in 1925 in Mexico City by Braulio Iriarte, with the help of President Plutarco Elias Calles. Diez Fernandez kept Modelo a private company that financed its expansion into producing malt, bottles, bottle caps and corks, and cartons through earnings rather than borrowing. He also acquired the regional breweries producing Victoria (1935), Estrella (1954), and Pacífico (1954). Modelo spent heavily on advertising during the late 1940s and early 1950s, much more so than its rivals. By 1956 it was the leading brewer, passing Cerveceria Cuauhtemoc and Moctezuma, with 31.6 percent of total beer production in Mexico. Modelo established plants in Ciudad Obregón (1960), Guadalajara (1964), and Torreón (1966) and created a national distribution network. 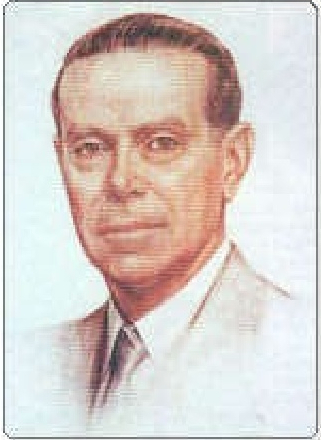 Antonio Fernández Rodríguez, also Spanish-born, succeeded Díez Fernández as director general of the firm in 1971. Under his leadership, Modelo’s share of the Mexican market grew from 39 percent in 1977 to 45 percent in 1985. 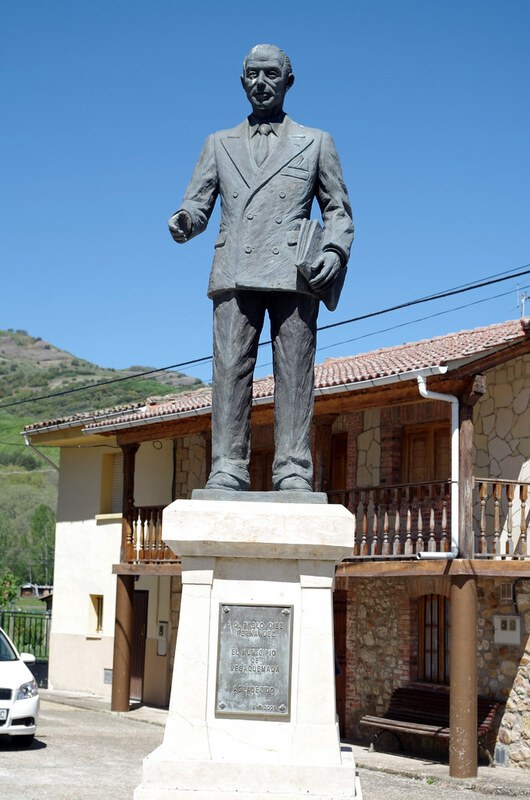 A statue of Pablo Díez Fernández in his hometown of Vegaquemada in Spain. 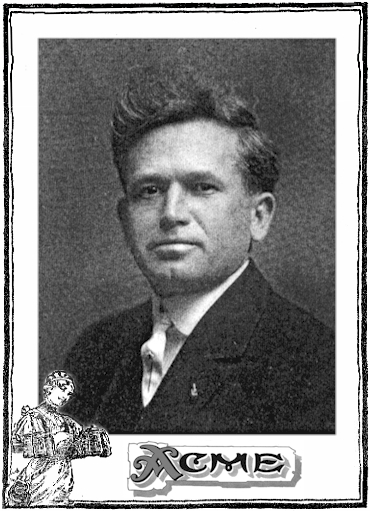 Today is the birthday of Jacob Paul Rettenmayer (June 29, 1881-February 24, 1927). He was born in Ellwanger, Württenberg, Germany, and came to the U.S. when he was 20, in 1901. He settled on the West Coast, and bounced back and forth between California and Washington, working at various breweries. He eventually settled in San Francisco, helping to start Acme Brewery, becoming its first brewmaster and president. 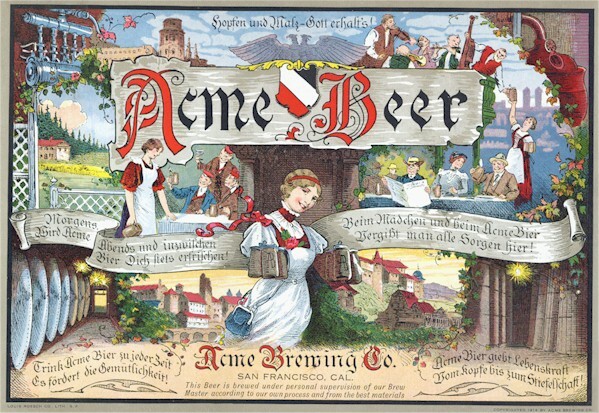 His little brother Franz, or Frank, Rettenmayer became brewmaster a few years later, and JP opened a second Acme brewery in Los Angeles. Just before, and during, prohibition he diversified into several other businesses. 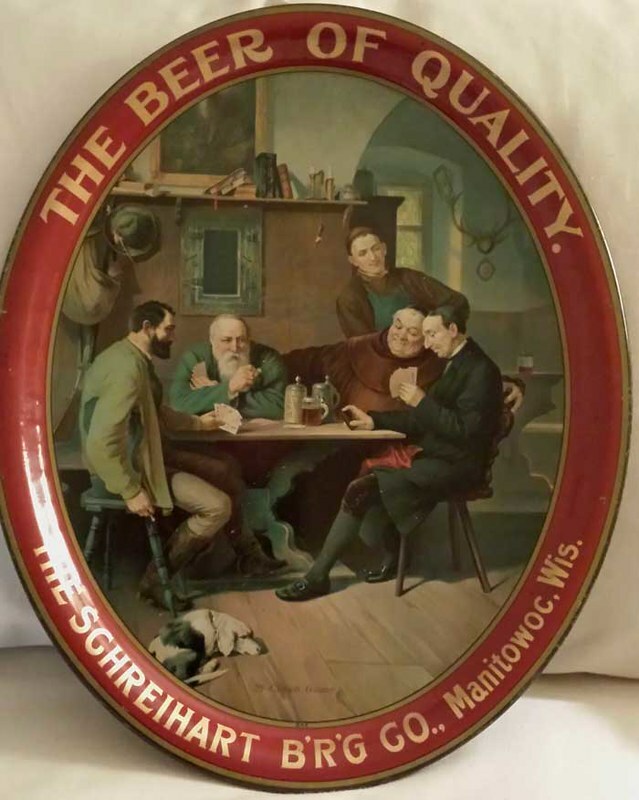 “Served apprenticeship as Brewer and Maltster at the plants of Minneapolis Brewing Company, Minneapolis Minnesota, under Mr. Armin L. Neubert who was then Master Brewer and superintendent of that company. Upon the completion of my apprenticeship I worked in that plant for six months as a journeyman, and then went to Los Angeles where I found employment with the Los Angeles Brewing Company. I worked in various departments of that plant for six months and then secured employment at the plant of Maier and Zobelein. I was employed by that firm from 1903 to 1905 when I left to attend Wahl-Henius Institute in Chicago. The course I took was the first six months duration and the first course given in the new Institute building. I was the honor graduate with a record of 99 in thirteen studies. Upon the completion of my course I returned to Maier and Zobelein in Los Angeles, remaining there until July 1, 1906. Upon obtaining my citizen papers in Los Angeles I went to Tacoma, Washington where I was employed by the Pacific Brewing & Malting Co. for a period of six weeks. Mr. Peter G. Schmidt, now President of the Olympia Brewing Company, invited me to go to Salem and I was affiliated with Salem Brewery Association for a period of four months. 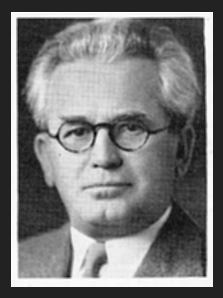 In the meantime the late Leopold M. Schmidt returned from Europe and he asked me to go to San Francisco to become associated with him in the Acme Brewing Company. Upon the organization of that company I became vice-president and a year later was elected to the presidency. I served in that capacity, as well as Master Brewer, from 1907 to 1917, when the Acme Brewing Company merged with five other breweries under the name California Brewing Association. I was elected President and General Manager of the consolidated enterprise and served until the advent of prohibition. 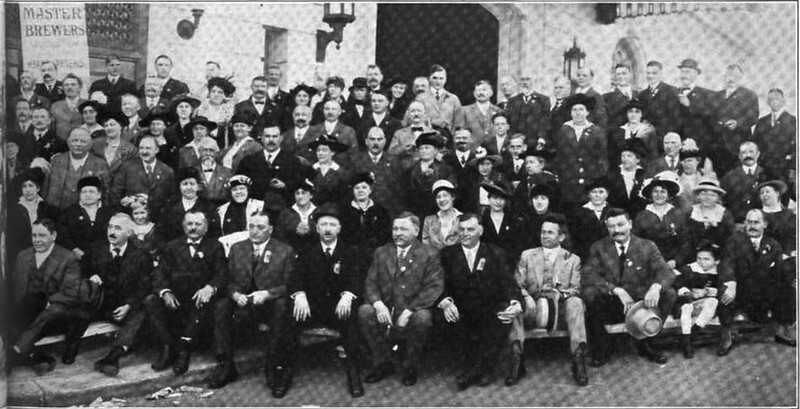 Before the formation of California Brewing Association I was instrumental in organizing the Cereal Products Refining Corporation and planned and developed the syrup and compressed yeast business to the manufacture of which a part of the plant of California Brewing Association was converted. Rettenmayer appears to have been quite active in the U.S. Brewers Association and digests are filled with his committee reports and other mentions. 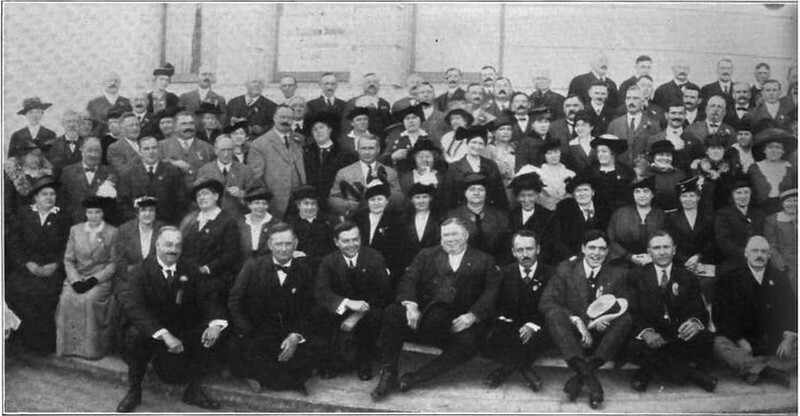 J.P. is somewhere in the two halves of this photograph taken on September 30, 1915, at the German House in San Francisco during the 27th annual convention of the Master Brewers Association. At Brewery Gems, Gary Flynn has a fuller account of the life of Jacob Paul Rettenmayer, and it’s worth reading in its entirety. Today is the birthday of Peter Weyand (June 29, 1821-July 17, 1875). 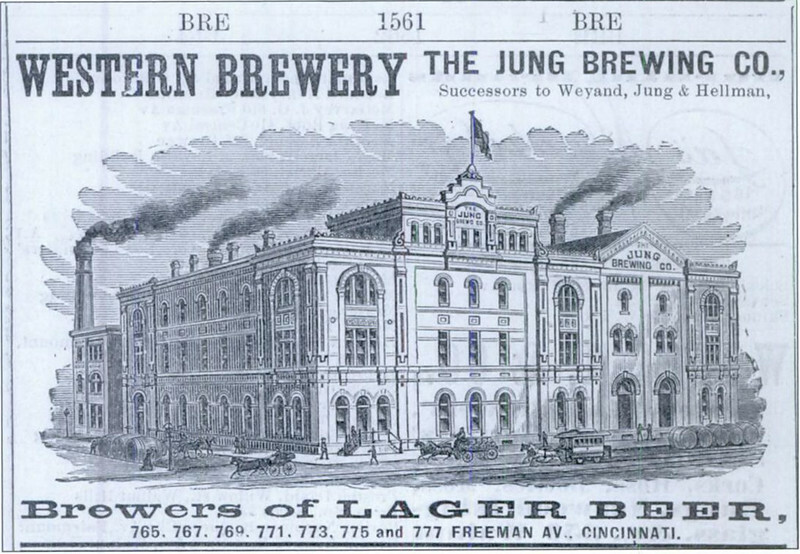 Along with Daniel Jung, he founded the Western Brewery on Freeman and Bank Streets in Cincinnati, Ohio. 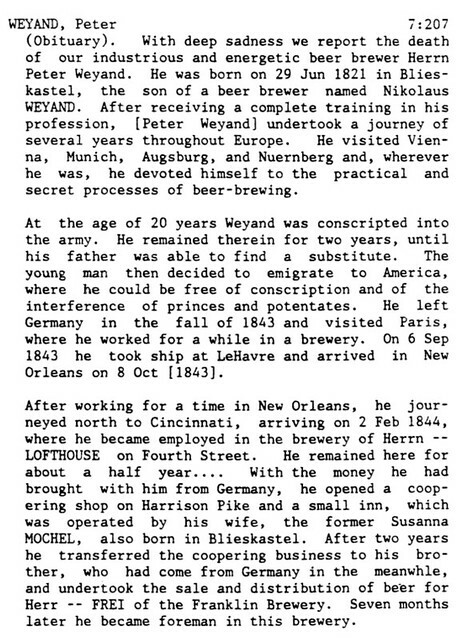 I was unable to find any photos of Weyand, and very few of the brewery when it used his name, too, but then only appears to be for a few years, from 1854-1857 according to some sources. 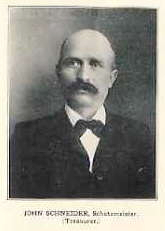 In 1879, Weyand and Jung partnered with Max Hellman and operated the brewery until 1885. 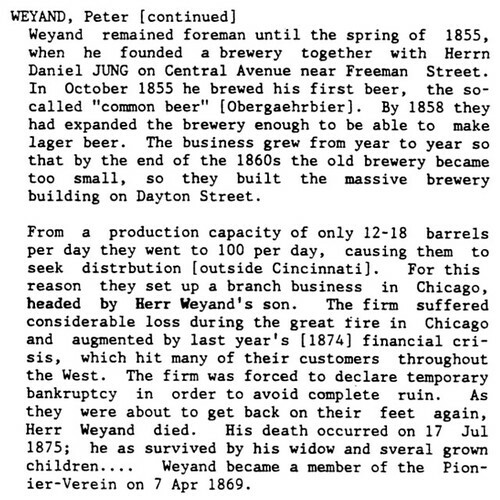 In 1885, following the deaths of Peter Weyand and Daniel Jung, the brewery was renamed the Jung Brewing Company. The Jung Brewing Company operated from 1885 to 1890. 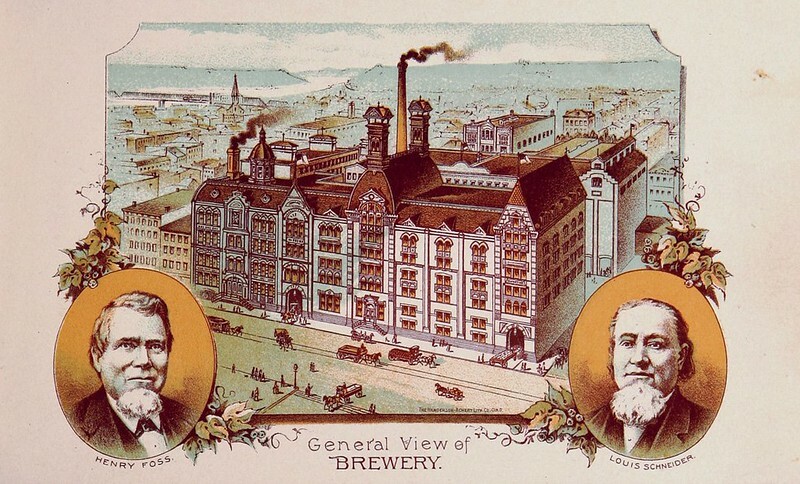 In 1890, the brewery was sold and merged with Cincinnati Breweries Company. Today is the birthday of John Schneider (June 28, 1849-?). 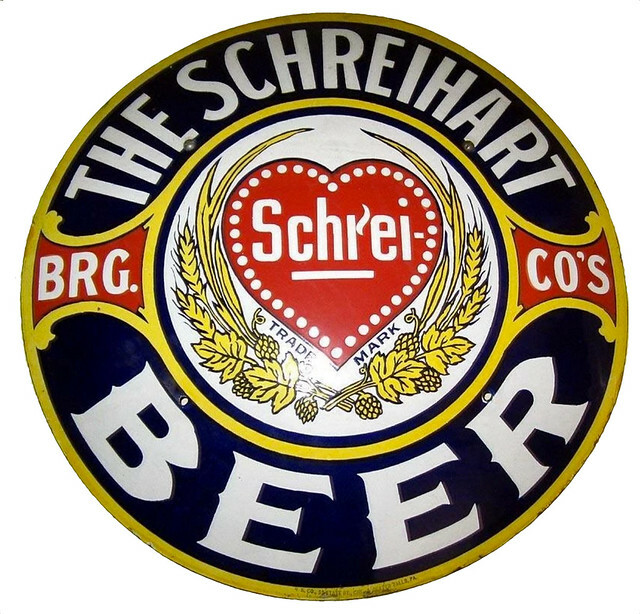 I believe he was a son of Louis Schneider, who founded the Louis Schneider Brewery in Cincinnati, Ohio. 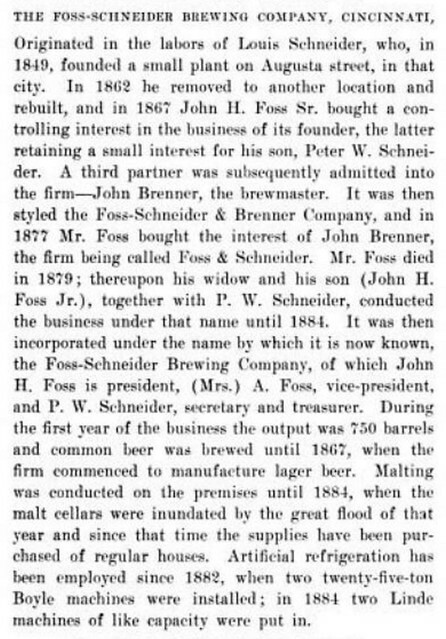 After taking on a partner, Henry Foss, it later became known as the Foss-Schneider Brewing Co. It closed during prohibition, but reopened when it was repealed in 1933, though closed for good in 1939. 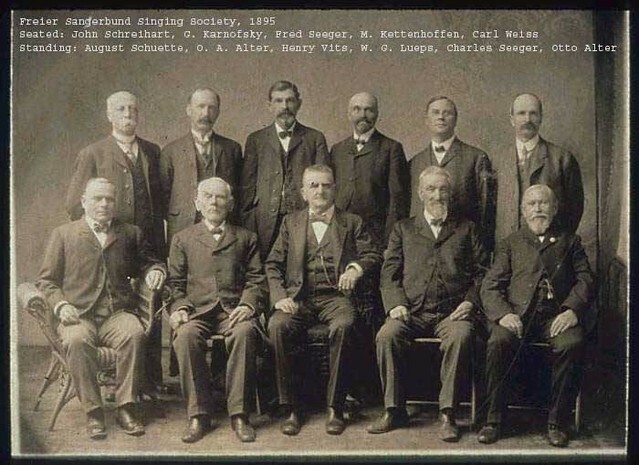 While I was unable to find much information on John, it seems that he was elected second vice-president of the Brewers Association at their sixth convention in 1893.